There's a lot going on in regards to anime. We have many new series running and overall I think the season is pretty decent. Although right now I currently have Love Live on my brain. I know people might be thinking, "What? It's just another idol anime!" For some reason though, I'm really drawn to the characters, plot, and overall, everything. 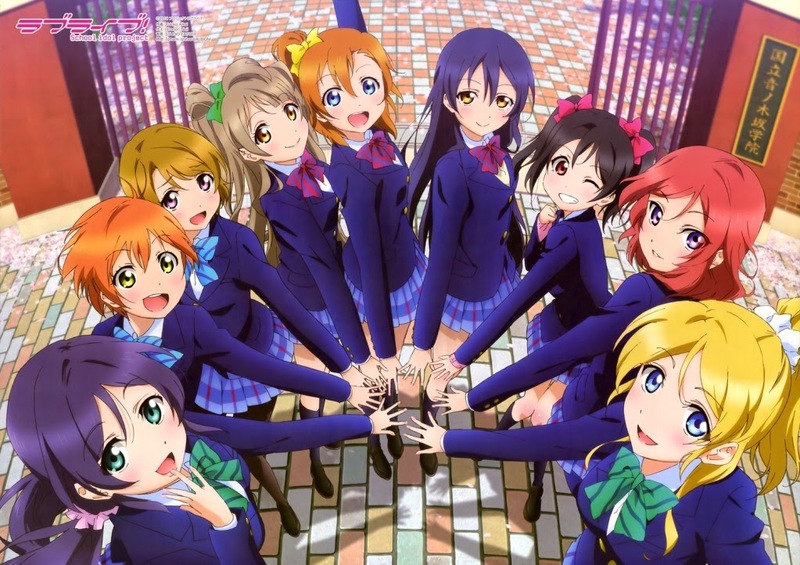 Although I'm watching the anime now, what really got me into Love Live was the mobile game. The game is called Love Live School Idol Festival, or sometimes just School Idol Festival when on the app store. If you own an Android or I Phone, or any sort of tablet, download it if you can! Please check the bottom of this post for links. So you might be asking, what is this game all about? Well, it's basically another anime rhythm game. When most people hear anime and rhythm, they think of Project Diva. Although I really love Diva, I've noticed that many people struggle to play the game and do well. It's just really hard for them for some reason. I've heard many people complain about the fancy backgrounds bothering them and making it hard to concentrate. Others have problems with playing on the PS3 controller or using the tiny PS Vita screen. Lastly, some people just don't like the music. While there are many gripes when it comes to Diva, Love Live luckily gets rid of a few of those. Following that train of thought, I can easily name a lot of pros when it comes to School Idol Festival. Right of the bat, the fact that the game is free and on my phone is great. I can literally play it anywhere and anytime. I also like that I don't have to pay at all for the game. Yes, there is premium content in the game that can be bought with money, and it may be easier to get ahead if you want to pay your way to victory, but even then it takes skill if you want to get to the top of the rankings. Aside from those things, the game itself is well put together. The app rarely crashes and runs relatively well even if I'm not on a Wi-Fi network. There's sometimes a little bit of lag, but usually a restart can fix it. One of the main things that makes the game so addictive and fun is the gameplay system that is used. It can get a little confusing, so I'll go into more detail. 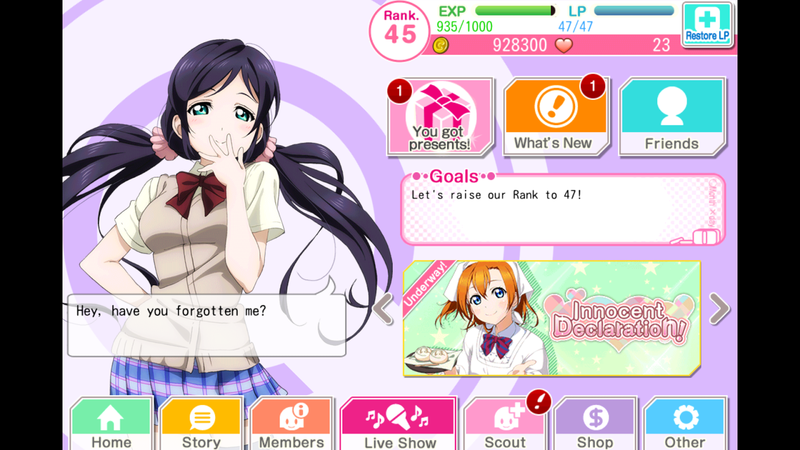 Your starter/main idol will find a home on your menu screens. She will provide commentary, random facts or insights to her personality and life, or remind you when you have new information or have received a present. Sometimes, others will want some attention and steal the spotlight! As a brief summary, you start the game off by picking a starter idol. Any of the main Love Live characters are available from the start, and you can get them all later on, so there's no need to be too worried about your decision. After deciding, you are given a brief tutorial of how to play and how the game works. 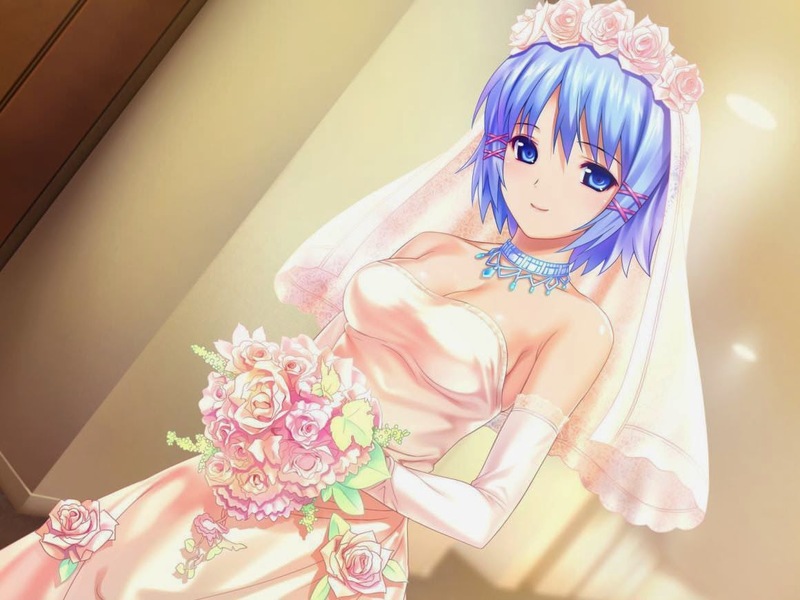 In short, your idol that you have chosen can be seen somewhat like a trading card. 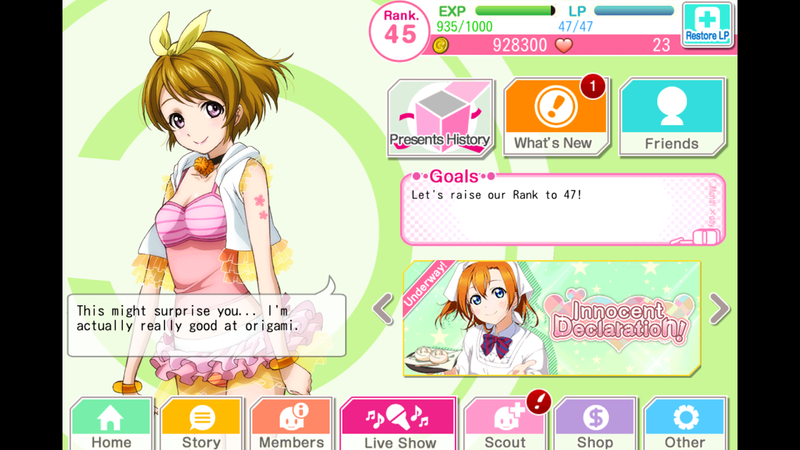 Instead, you're not going to do any trading, but you will level her up and make her the best idol she can be. This is done by something called practice. In practice you use one or more cards to level up another card. 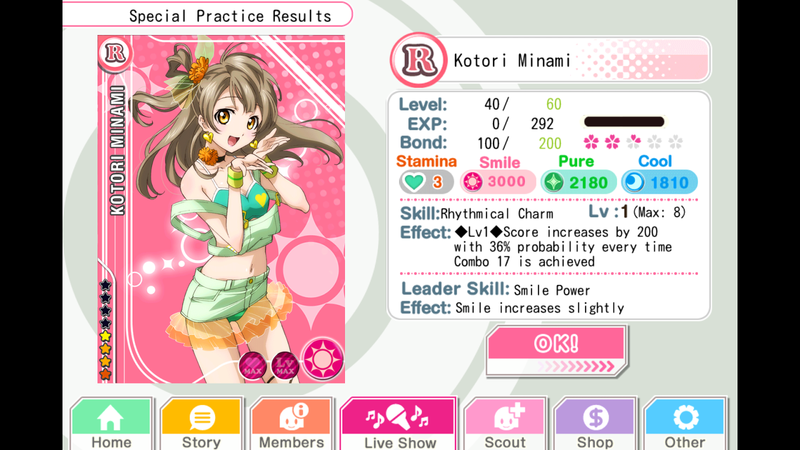 Since the first idol you obtain is a rare card, you want to use your common cards to level her up. Now you might ask, what are common cards? They are basically cards of various girls, who are easily obtained when completing songs or scouting (scouting is basically equivalent to buying a booster pack). 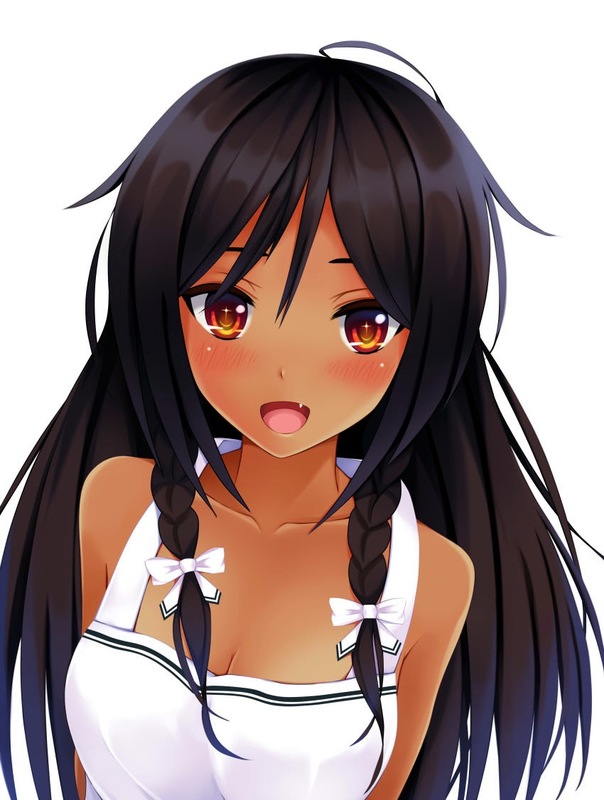 They do not have voice actors, nor special abilities, and are much weaker than the main idols. 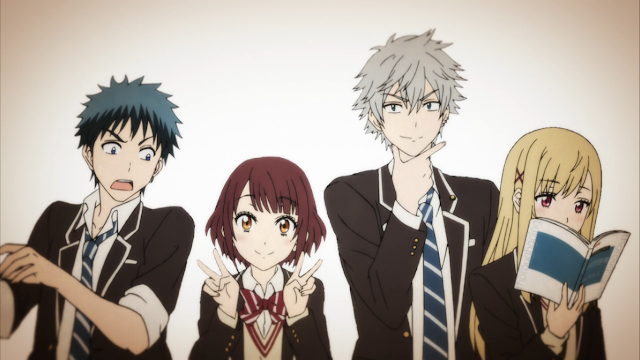 Still, they all have back stories and personalities that set them apart from each other. Despite these differences, there are some people who even like these characters more than the main cast! 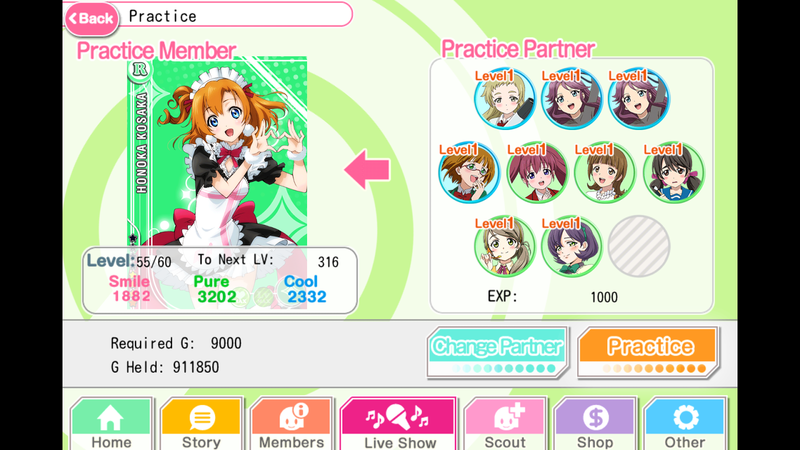 To level up your idol, you have to lose a few members. Don't worry though, you'll get them back! After you've leveled your idols, you can put together a team. 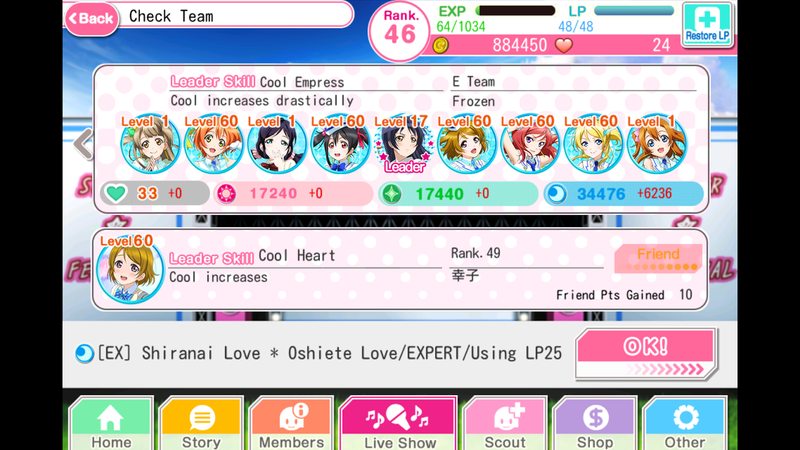 Having team of idols that matches the color of the song increases your stats. Friends can help give you a boost as well! So say you have maxed out the level of a card using practice, now what? Basically you can special practice. 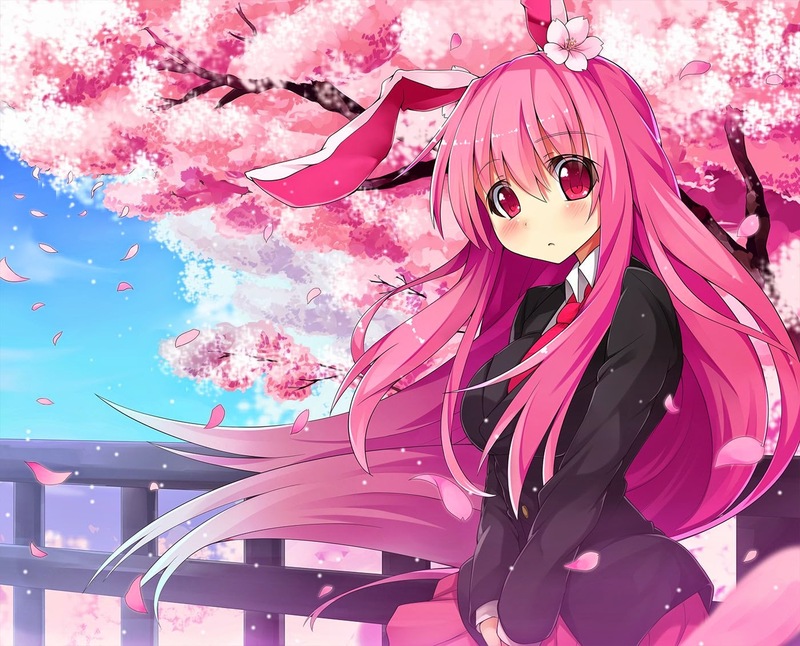 Special practice is an optional way a normal card, usually represented by the character in a normal outfit or school uniform, can turn into an idol. When they become an idol they gain increase to their stats, new artwork, and even new skills. Again, this is optional, so if you really like your card's art you do not have to idolize them. With these cards you can form teams of idols, and then participate in songs. (Or referred to as a Live Show.) It's a little difficult to explain the actual gameplay, so please take a look at the video towards the bottom of the page as an example. 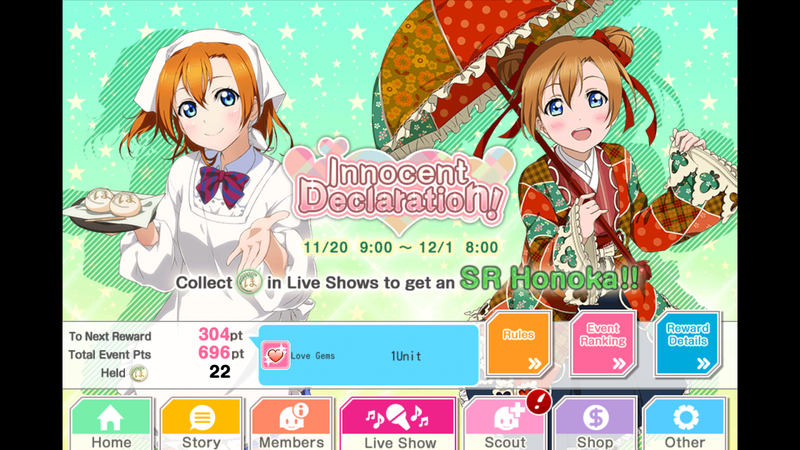 When you complete a song you get rewards such as love gems, new story segments, and more. 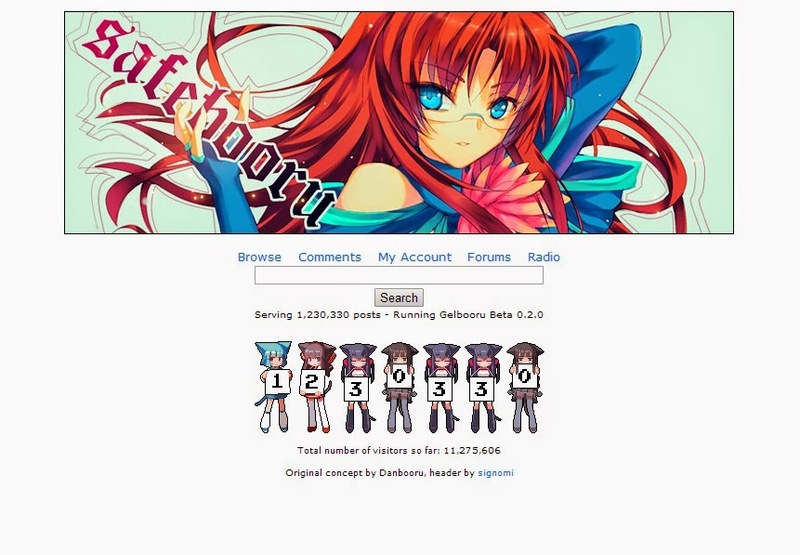 You can also get points to do more scouting and acquire more members. 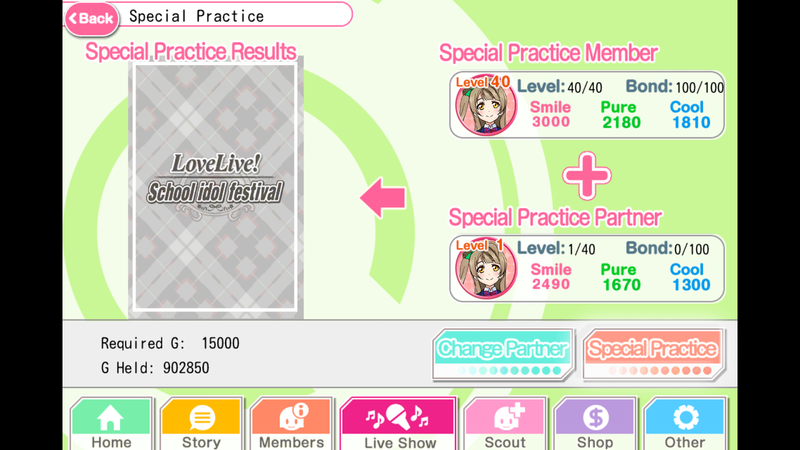 Love gems can be used to refill your LP (Basically stamina, which allows you to play more. It naturally refills over time though.) If you want to keep playing, you're have to keep spending those gems. Although others might disagree, I feel that this system is really great, because you have a constant intake of members, and a steady rate of growth for each player. No one can really ascend much higher than anyone else unless they're incredibly skilled or if they use real life money as a boost. With this, that's all for the brief summary! It probably seems like a lot, but it's easier to learn the game by actually playing it than reading about it. That's why I encourage you all to go out and download the app if you are able to! Before the download links below, I'll post a few pros and cons in case the description above was a little too much to read. It's also fun to take part in events to get a rare card. Many people wait it out for their favorite idols and go crazy! You play songs in order to get the special event items and event points. For this event, the items are cakes. 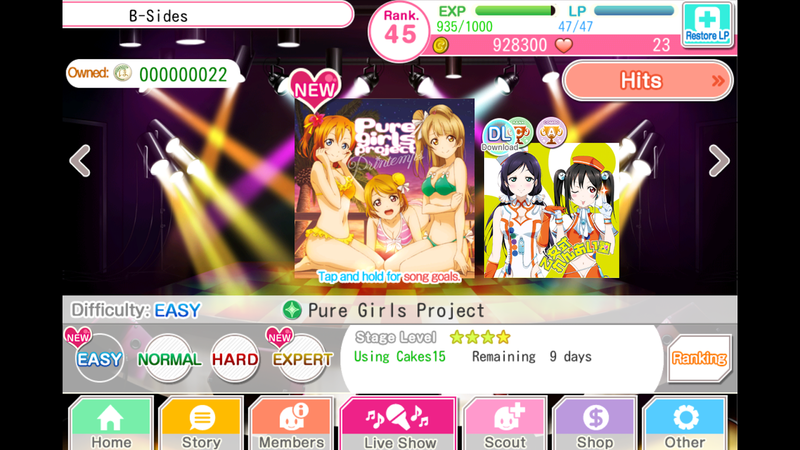 You use the cakes to play the special song to earn even more points towards the event. The higher your points, the more rewards you get when the event ends! Can be easily played anywhere and anytime. Graphics and layout are easy on the eyes. Free to play, no need to pay. Many different characters, so anyone can find a favorite. Less complicated system than other rhythm games. Can disable animations and popups, for players who dislike distractions. Interactions with the idols is great. Not too heavy on battery life. Each character has background stories, in addition to the main story. Events are going on almost all of the time. Different levels of difficulties for everyone. Daily rewards just for logging on. Sometimes there is lag and it can ruin perfect scores. If you're someone who likes to play nonstop, you might run out of stamina often. The longer you play, the slower the gameplay becomes. Small screen size may be difficult for certain players. The game doesn't explain everything, might be confusing to new players. Thank you for taking the time to read this post, please check out a few of my others! Project Diva: Not Just For Vocaloid Fans? New version of our sucessful School Idol Festival Hack Tool has been released. Use our amazing School Idol Festival Cheats tool to generate unlimited Gold and Love Gemsand get max Stamina. Click here to download the new version of The School Idol Festival Hack Tool NOW for free without surveys!